It was rather strange that 15 minutes into the wedding mass and I still don't see my usual lector-partner. Normally, she'd be arriving in the church earlier than me, and I arrive around 20 minutes early. That's how punctual she is. Five minutes later, or ten minutes before the wedding, I'm starting to worry that she won't be coming. I double-checked the wedding schedule at the sacristy. I confirmed her name as the assigned lector for the day's scheduled wedding. I had the option actually of getting someone from the wedding entourage milling at the church's entrance door to be mass readers. But given my experience in the difficulty of getting volunteer mass readers and in consideration of time, I just abandoned that option. Five minutes more, and I was preparing myself to be the wedding mass lector as well. I was convinced nobody was coming and that, again, I'll just have to multitask as lector and commentator. It's nothing new to me. I've done it before. Decided that I will take on the lector (or mass reader) role as well, I went to the ambo. This is to open the missalette to the page of the First Reading. This is the first reading to be proclaimed supposedly by the mass readers. 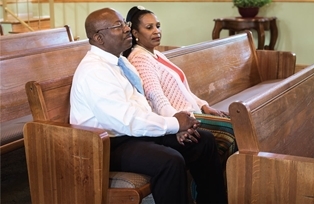 As I was thumbing through the pages, I noticed a couple of persons, a gent and a lady, sitting at the reserved pew where the mass readers are supposed to sit. Their attire looked decent enough to look like mass readers. And why would they be there at the reserved pew, in the first place? So I approached the two persons and asked them if they were the mass readers. And they said yes! I was both relieved and angry. I was relieved because I no longer had to take on the lector role. Angry, because NOBODY informed me that there were mass readers. Ordinarily, I would be expecting any of the mother-butlers or the wedding coordinator to tell me. But since the assigned lector didn't come, that means she knew beforehand that there would be mass readers for the wedding. She should've at least called me about it. I was so annoyed, because I still had to orient the mass readers for their roles on the readings. Orienting the mass readers for the wedding mass isn't difficult. However, there wasn't much time left - a little less than five minutes, before the wedding was to start. And the priest? The priest was quite known for a stickler for starting ON TIME. As there was still a few minutes left, I immediately summoned the appointed mass readers to come up the ambo. I gave a quick orientation right then and there. I spoke so quickly that I wasn't sure I was making sense to the two. But when asked if they had questions, they didn't have any. After a few more minutes, I was done. I heard a mother-butler behind me say "It's time!" as she was passing by. As I briefly turned my head to acknowledge her, I saw the officiating priest peering out from the sacristy door. I knew what that look meant. Without even saying a thing, I gave the thumbs up sign to the two mass readers telling them "we're good to go" and the wedding mass will be starting soon. With that, I rushed to the commentator's lectern and proceeded with the introduction in the wedding mass.